The guests at the wedding reception giving three cheers to John and Mrs. Worthington. 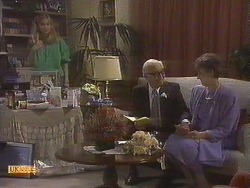 MADGE: I wouldn't worry, Harold – she'll probably find nothing at all! HAROLD: I know, I know... but is this the *only* solution? BEVERLY: *Harold*? Madge, I don't think you quite understand: Harold's snoring is a *physical* problem, not a *mental* one. The idea is to hypnotise *you* so you start getting some sleep. Harold bursts out laughing and starts making clucking noises! Madge clips him round the head! JOHN: I know *I've* done well! MRS. WORTHINGTON: It was kind of *you*, dear. [Grimly] As for *Joe*, it's the absolute *least* he can do after that awful speech, hanging out the dirty Mangel linen in front of the whole world. It's a good thing that I'm a Worthington now – nothing could happen to put me in a bad mood today. MRS. WORTHINGTON: Oh, it's nothing important – only Mr. Clarke. DES (walking in, muses): Thanks...! DES: Golf...? Um, yeah, that sounds... that sounds real good, mate! I'll let you know! MRS. WORTHINGTON: It certainly has. Now we can relax – alone at last. JOHN: We've got quite a big day tomorrow, too. Perhaps we should get an early night? JOHN: I *could* carry you across the threshold of the bedroom, I suppose! MRS. WORTHINGTON (awkwardly): I... suppose you *could*. Yes. MRS. WORTHINGTON: Oh, this is silly. Come on. You don't need to carry me – I'm quite fit to walk. In fact, I'm quite fit for *anything*! JOHN: Ooo... let's walk a little faster, then! 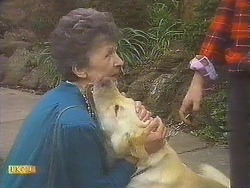 KATIE: Well, I know she's supposed to be an old grouch and everything, but she's really nice to Bouncer – *he* loves her. GAIL (grins): So does her new husband, I gather! TODD (mutters): He must be mental, I reckon! 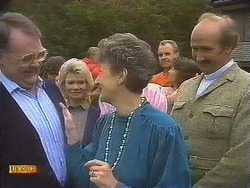 PAUL: Oh, Mrs. Mangel's all right – she just hasn't got much to be thankful for, that's all. You see, old people can get bitter if they've had a hard life. GAIL: Yeah, they can – but in her case, I think marrying Mr. Worthington will make a huge difference – and the overseas trip...: who knows, she might even *enjoy* herself for once! TODD: I suppose so. But do I really *have* to, Uncle Jim? I'd really rather stay *here*, if that's OK.
Jim looks at Paul and Gail in surprise. 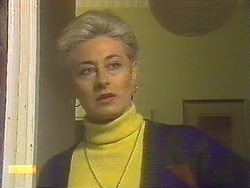 BEVERLYL: I'm going to count to three – and when I say the number three, you're going to wake up relaxed and feeling fine. One... you're starting to stir slightly now... feeling fine. Two... you can feel the natural muscle tone returning to your body. Three... eyes open, wide awake and take a deep breath. BEVERLY: I'm *fairly* sure. Why? MADGE: Well, I mean, my eyes were closed all the time, but I was wide awake – I heard everything you said. MADGE: Could you show me how to make Harold act like a chicken?! 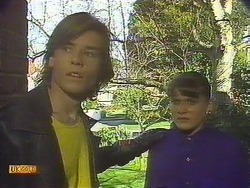 TODD: Look, no offence, Uncle Jim, but *mum and dad* were always promising us that things would get better, too. JIM: Yeah, well, Beverly and I are different. Anyway, what makes you think things are going to be better *here*? Married couples are *always* fighting. 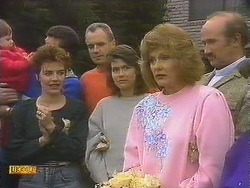 TODD: Look, Paul and Gail just seem to *understand* about me more. TODD: They just seem to understand about kids more – that's all; like playing the video games and stuff. JIM (coolly): You haven't been going back to that parlour again, have you? JIM: I don't care, Todd – you were strictly forbidden to go anywhere near that parlour again. [To Paul and Gail] And *you* both knew that. JIM: As for getting rid of this obsession with video games, what do you call *this*? A pork chop? The boy's eyes lit up like flashbulbs when he was talking about that parlour. You haven't cured him, you just *encouraged* him. Go and pack your things, Todd – NOW. Todd runs off upstairs. 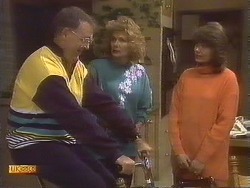 Jim looks at Paul and Gail in annoyance. DES: Put the chain on the door, will you?! As Joe heads out, Jessie comes in, carrying a pile of books. She tells Mike that she hopes it's not a hassle, but her mum's coming to pick her up at about 2:30, and she asks if they'll have quadratic equations sussed out by then. Mike nods that they should do; they'll get stuck into it – although he's got to take a break shortly ‘cos all the neighbours are getting together next door to see off the old duck from over the road, as she's going to England. MRS. WORTHINGTON: Sure as one ever *can* be, I suppose. I only wish I could've packed you as well. JOHN: I never unpacked them, as a matter of fact, Joe! MRS. WORTHINGTON: Now, I'm not sure when I'll be back, yet – but this household is to maintain its high standard at all costs. MRS. WORTHINGTON: You can make whatever arrangements you like with Henry Ramsay about the garden, but the grass is to be kept short and the roses sprayed and mulched – oh, and the gnomes might need a little wash from time to time; and be gentle with Cedric – the poor little thing... well, he hasn't been quite the same since that dreadful scavenger hunt! JOE (counting off on his fingers): Right – the house, the roses, the grass, gnomes, Cedric... Anything else?! MRS. WORTHINGTON: Yes: I want you to promise to look after each other. After all, Jane, you're virtually still a baby, and... and Joe, you desperately need someone to keep you out of mischief. Do I have your word? JANE: You have *mine*, nan. JOE: Yeah, I promise, mum. MRS. WORTHINGTON: Good – and I want an assurance from you both that you'll take great care of Bouncer. JANE (smiles): Don't worry, we'll look after Bouncer. 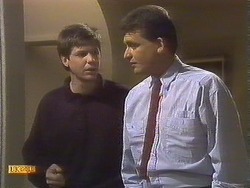 JOE: Yeah, me and him are going to be great mates – aren't we, mutt! MRS. WORTHINGTON: *You* can't have that – you're already *married*. Why don't you keep your hands to yourself? MADGE: It was an *accident*. MRS. WORTHINGTON: I don't care. Give it back to me this instant. MADGE: There. Bon voyage, you silly old biddy. MRS. WORTHINGTON: By the way – I'm going to *miss* our little arguments. Aren't you? JOE: Don't leave it another twelve years before I see you again. MRS. WORTHINGTON: I won't. I *won't*. And Joe... be good. MRS. WORTHINGTON: And I love you too, dear. 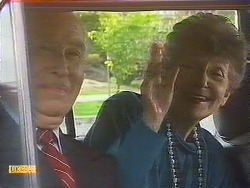 Joe and Jane watch sadly as the other neighbours throw rice at the car as it heads off down Ramsay Street and the erstwhile Mrs. Mangel leaves Erinsborough. MRS. ROSS: Mr. Young, is it? MRS. ROSS: I can't thank you enough for coaching Jessie like this. Her father's not too fussed, but I'm forever at her to try and get her marks up. I'm sure she's bright enough – it's just a little lack of self- discipline, I think. MIKE: Well, whatever it is, she's certainly improving. MIKE: Yeah. She never talks about her mum that much. 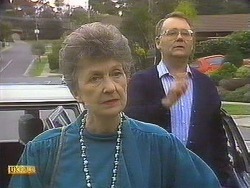 DES: You don't talk about *your* mum, either. MIKE: No, I suppose not. With that, Mike returns to the table and discovers that Jessie has left one of her books. He comments that he'll take it over later, on the bike. JOE: Oh, I was *eating* that, you mongrel! JOE: I've laid *bricks* with more credit than this dog! Bouncer, you're a dodo! [To Jane] I reckon we should just give him away. JOE: What am I supposed to do? He won't have a *bar* of me. What am I supposed to do? JANE: I don't know; sort it out between the two of you – and get this mess cleaned up! When it comes to house- guests, I'd rather have Bouncer *any* day! She leaves the room. Joe finally gets to listen to the racing results – only for a look of disappointment to cross his face when he hears them! JESSIE: I'm sorry. I'm really sorry, OK? ... OK... Just keep *away* from me, will you? JESSIE: Ow... Just *stop*, will you? Leave me alone. JESSIE: I'm in trouble for leaving my textbook at your house and not being able to do my homework. MIKE: Look, it's OK. You're safe now. Your father won't be hitting you anymore. MRS. ROSS: Jessie, you get yourself back in here this minute. She stops in her tracks as she finds Mike standing there. He stares at her in shock.